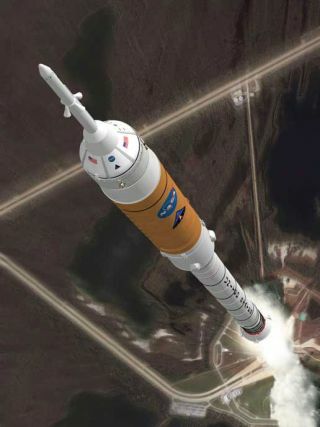 A concept image of Ares I crew launch vehicle. NASA hasrepeatedly sent scale-sized versions of its plannedOrion spaceship plummeting back to Earthin a series tests to pinpoint the best way to return future astronauts safely back to terrafirma. The droptests, performed at NASA’s Virginia-based Langley Research Center [image],are just one of several technical milestones the Orionspacecraft and Aresrocket programs hit in recent weeks as the agency pushes ahead with plansfor its space shuttlesuccessor [image]. The Orionproject completed a critical system requirements review this month withLockheed Martin, NASA’s primecontractor of the project, which laid the foundation for the spacecraft’sdesign and development. NASA also put out a call for proposals this month forcontractors interested in supplying the upper stage of Orion’s Ares 1 rocketbooster [image],with engine tests for its heavy-lift counterpart -- the Ares V [image]-- are also underway. “I thinkwe’ve made a tremendous amount of progress,” Hatfield said. NASA chiefMichael Griffin has said the first crewed flight of an Orion spacecraft and itsAres booster willbe delayed until at least March 2015 -- well after the planned September2010 retirement of the agency’s aging three-orbiter shuttle fleet -- due to budgetissues. That first operational launch was slated for September 2014. “It doesn’tchange the design so much to have that slip, it’s really a project managementissue,” Hatfield said of the slip, which Griffin has attributed to a $575 million shortfallin the agency’s expected 2007 exploration budget. Hatfieldsaid one of Orion’s major steps forward was a successfulweight loss program to shave excess mass off the hefty vehicle. “We are nowback into the weight requirements where we want to be,” Hatfield said. A series ofdesign changes following NASA’s selection of Lockheed Martin to build Orioncapsules found the 50,265-pound (22,800-kilogram) spacecraft to be about 2,976 pounds(1,350 kilograms) overweight, though they were still light enough reach orbitatop an Ares 1 rocket, NASA has said. WhileHatfield pressed his project teams to streamline their systems to eliminateunnecessary weight wherever possible, the biggest savings came by encapsulatingOrion’s service module, which houses the vehicle’s vital systems, with ashroud-like shell rather than align it with the exterior of its Ares 1 booster. Constructionwill soon begin on a boilerplate Orion capsule, a bare bonesprototype designed for launch abort system tests, at NASA’s Langley center as Lockheed engineers assemble to the first rocket motors for thespacecraft’s escape tower, Hatfield said. The Orion boilerplate and escapetower are expected to undergo their first field trials next fall at New Mexico’s White Sands Missile Range, he added. This week, NASA also announced a five-year, $63million plan to perform a series of thermal, electromagnetic and sound andmechanical vibration tests for the Orion spacecraft at Plum Brook Station inthe agency’s Ohio-based Glenn Research Center. While workcontinues on the Orion capsule, a separate team of engineers is tackling thespacecraft’s two-stage Ares I and its heavy-lift counterpart the Ares V, bothof which are slated to launch initially from NASA’s Pad 39B site at the Kennedy Space Center in Florida. The Ares Irocket is designed to use a five-segment version of the four-segment shuttle solidrocket booster (SRB) and a liquid propellant-fueled upper stage to ferry newcrews to the InternationalSpace Station (ISS) or onwards to the Moon.Proposals for the booster’s upper stage are due by April 13, and NASA officialsexpect to make their choice in August. The Ares Vis expected to haul heavy cargo, such as future lunar landersand rocket stages to send Orion crews towards the Moon, using two evolvedrocket boosters and a core stage that draws on NASA’s shuttle and Saturn Vexpertise. Severalwind tunnel and computer modeling studies are underway to determine how Ares Iand V boosters will behave during launch and control their roll rates, NASAofficials have said. Ares V engineers have also staged a series of test firingsfor the booster’s RS-68 rocketengines, five of which will form the core of the heavy-lift rocket’s powerplant [image].